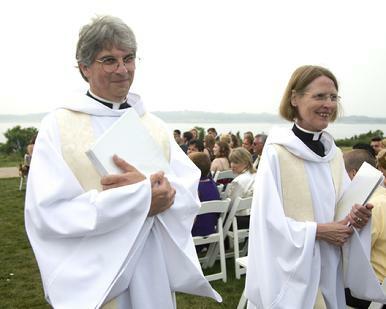 Charles was ordained a Roman Catholic priest in 1980; he spent five years in a parish in New York and over ten years as Administrator and Retreat Director of a large New England Retreat House. Presently, he works as a counselor. Cheryl has her Masters of Theology and was ordained a priest in 1997. She served over eighteen years in many different pastoral capacities. Presently, she teaches college English and Communication. Cheryl and Charles are certified both by ordination and by most states to perform wedding ceremonies. Collectively, they have extensive experience in all aspects of marriage preparation, counseling, and ministration. They have a broad repertoire of rites and rituals using creative and innovative options. As a married couple, they are committed to minister to those seeking to marry, to renew wedding vows, and or to solemnize their commitments. Simply, they love working with lovers.